The Techniques module provides a series of exercises that can be done with a Speech Language Pathologist to help users understand the techniques required for certain types of sounds. The screen presents a list of different kinds of exercises that would be part of shaping exercises. Tapping on the row in the exercise table will open up a new screen for each exercise. 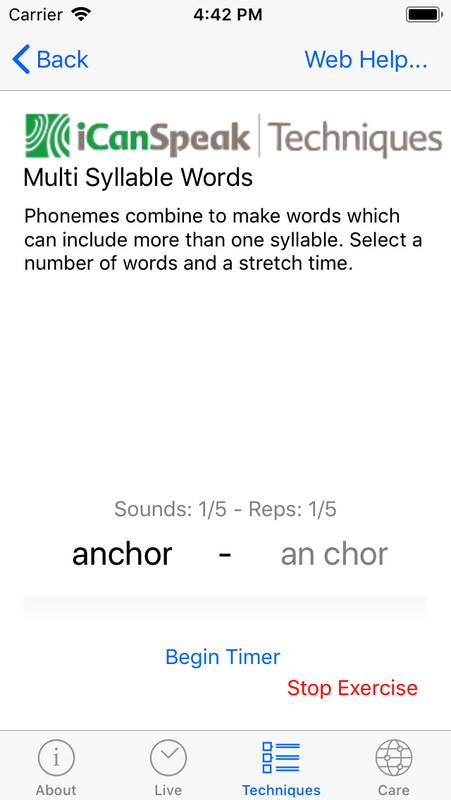 Exercises include timed breathing, shaping to Class 1, 2, 3 and 4 sounds (for phonemes single syllable words, multi-syllable words and sentences) as well as reading with choral speaking effect from the iPhone text to voice option. Each of the exercises comes with the option for the number of repetitions as well as the duration of the repetitions. The Web Help ... button will load up the appropriate help page from the web site. Breathing is an essential component of speech, as all speech sounds are vibrations that occur in air. The speech system stores air, pushes air through the vocal apparatus, and gives this stream of air patterns of vibrations, which we interpret as individual speech sounds. In order for these sounds to be properly produced, a constant stream of air is required. The breathing exercise in iCanSpeak is designed to practice slow, deep, and full breaths, which are essential for fluent speech. The user can set the duration of their breaths (ex: 3 seconds in, hold for 3 seconds, 3 seconds out), and the number of times they would like to repeat this exercise. This exercise is recommended as a 'warm up' before any speaking exercises are attempted. By assigning this exercise to begin each patient's daily routine, it will ensure that the patient is in the right 'frame of mind' when it comes to proper breathing technique. The basic building blocks of speech are called phonemes, and the English language is made of up of 43 of them. They are divided into the classes based on the different uses of the vocal system. This group is distinguished as sounds that are made with an open vocal tract. These include A, E, I, O and U. These sounds are produced by combining voicing with constrictions in air flow through the vocal tract, with different sounds being produced by varying the place and the amount of constriction. These include L, M, N, R, V, W, and TH+ (with voice). Fricatives are produced by combining a lack of voicing with constrictions in air flow through the vocal tract, with different sounds being produced by varying the place and the amount of constriction. These include F, H, S, SH, and TH- (without voice). Plosives are are produced by a momentary stopping of the air flow through the vocal tract, followed by an (explosive) burst of air. These bursts can be either accompanied by voice, or not. These include B, D, G, K, P, and T.
The Phonemes exercise provides the chance to use techniques like stretch syllables, gentle onsets and full articulative motion for a range of sounds. The selection spinner allows the choice of 4 settings, Class of phonemes, number of sounds, the duration of stretch or onset, and the number repetitions of each sounds. The Start button will select a number of random sounds, and be ready to begin the exercise. The selection spinner for class of sounds, number of sounds, duration of sounds and the number of repititions. The start of the exercise loop with the phoneme in dark text, and a sample of how that phoneme should be sounded. The 'Begin Timer' button starts the exercise. 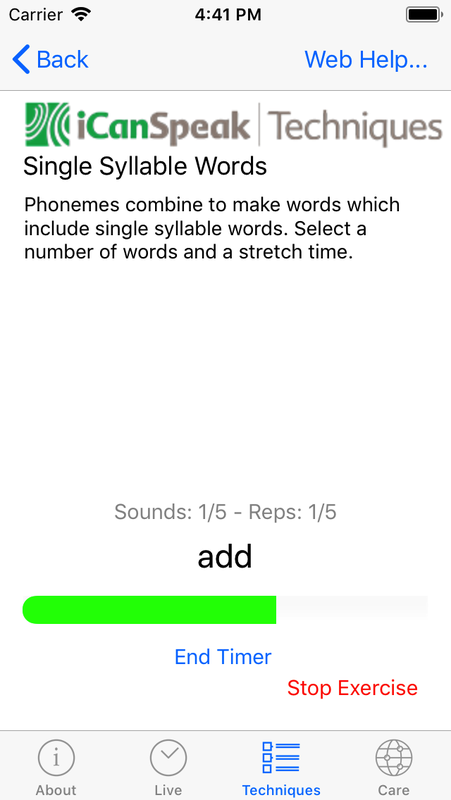 The progress bar shows the amount of time used in the stretch for the phoneme. The 'End Timer' button will stop the timer. Once the Exercise loop has begun, the timer for each sound can be started with the Begin Timer button. During the loop, the phoneme will be displayed (JA in the example above) along with an example word (jail) to indicate how it should be pronounced. The progress bar will show the amount of time used until the End Timer button is hit. Building on phonemes, the exercise for single and multi-syllable words provides a chance to use techniques for different classes of sounds in a word. The user can choose the class of sounds, along with the number of times the word will be repeated. The system allows the selection of single syllable words that are grouped into the same four classes as phonemes (Class 1 - Vowels, Class 2 - Voiced Continuants, Class 3 - Fricative Continuants and Class 4 - Plosive Continuants). The Single and Multi Syllable Words exercise provides the chance to use techniques like stretch syllables, gentle onsets and full articulative motion for a range of sounds. The selection spinner allows the choice of 4 settings, Class of phonemes, number of sounds, the duration of stretch or onset, and the number repetitions of each sounds. The Start button will select a number of random words and be ready to begin the exercise. The start of the exercise loop with the first word ready to be spoken. The progress bar shows the amount of time used in the stretch for the word. The 'End Timer' button will stop the timer. The 'Stop Exercise' button stop the exercise no matter how many words and repititions are left. The word is show in black text on the left, and the split between the syllables shown on the right side in grey text. Building on single and multi-syllable words, the exercise for phrases and sentences provides a chance to use techniques for different classes of sounds in a phrase or sentence. The system allows the selection of a sentences that inlcude the same four classes as phonemes (Class 1 - Vowels, Class 2 - Voiced Continuants, Class 3 - Fricative Continuants and Class 4 - Plosive Continuants). The Sentences exercise provides the chance to use techniques like stretch syllables, gentle onsets and full articulative motion for a range of sounds. The selection spinner allows the choice of 3 settings, Class of phonemes, number of sounds, and the number repetitions of each sounds. Since the sentences can vary in length, no selection for time is provided. The Start button will select a number of random sentences, and be ready to begin the exercise. The selection spinner for class of sounds, number of sounds, and the number of repititions. The start of the exercise loop with the first sentence ready to be spoken. The 'Begin Timer' button starts the exercise, and the sentence can be repeated the selected number of times. A count up timer shows the amount of time used for the sentence. The Choral reading exercise allows a user to have the iOS device speak a sentence or paragraph along with them. This choral reading effect is similar to what is used in Live, though not using spontaneous speech. The speed of speaking can be adjusted. The default screen opens with some sample text that can be used. The speed can be adjusted with the slider, with 1.0 being considered 'normal' speech. Slower speeds make it easier to practice techniques. The 'Start Reading' button will have the iOS device start to read the text out loud. The 'Sentence' button will randomly select a sentence from the internal data base, and the 'Paragraph' will place two sentences to be read with. The slider can be used to change the rate, and the 'Start Reading' button will start the reading. The 'Stop Reading' button can be used to stop the reading if the text is too long or not working for the user. To provide variety for a user, and to provide for some interesting reading, the user has the option of copying text from another app (a favourite web site might be an idea) and have the iPhone read the text by importing from the clipboard. A user can select text from any other app on the iOS device, however it will normally be Safari to allow some text from a favourite web site to be used. By pressing on text, then moving the start and end markers, text can be selected, then copied to the clipboard. Double pressing on the home button will open the app switcher, and iCanSpeak can be selected. Pressing on the 'Clipboard' button will paste the copied text into the reading box, and then the 'Start Reading' button will start the iOS device to read the text. Once reading has started, the 'Stop Reading' button will appear to offer the option of stopping the reading if required.